Now with deli and pizza out of the way, it was time for me to experience a true New York hot dog, and Papaya King was the first place that came to mind. The King actually has a number of locations (including three in Manhattan and one in New Jersey), but I wanted to go to the original on 86th St on the Upper East Side. 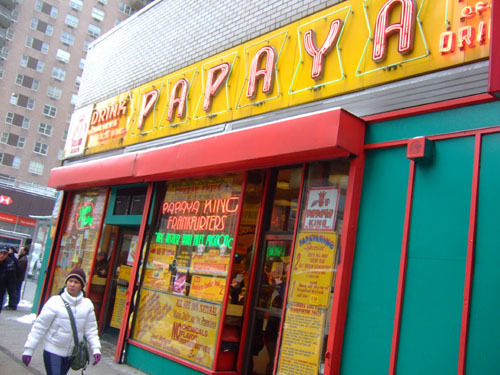 Originally founded in 1931 by Gus Poulos, the restaurant was named Papaya King because it originally sold only tropical fruit drinks, though it quickly expanded to selling hot dogs due to the large German population in the vicinity. 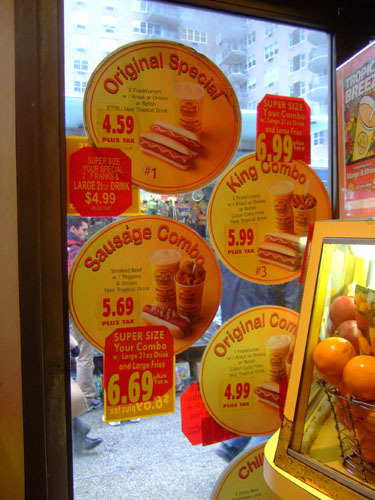 Because of its success, the chain has spawned two "Papaya" competitors--Gray's Papaya and Papaya Dog. Here we see the exterior of the original building. Interestingly, on March 22, 2007, the location was shut down briefly by the Health Department after the news program Inside Edition found rats inside the premises. The interior is suitably cramped. There is no seating; rather, patrons can stand next to counters along the windows. Overall, not a comfortable dining experience. 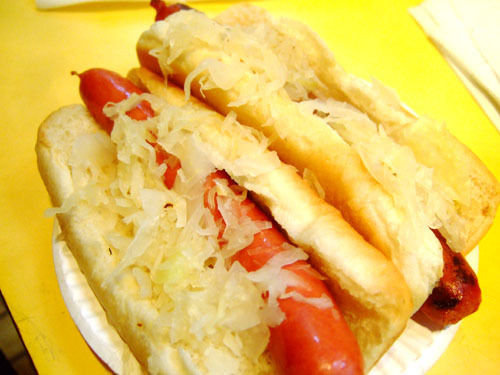 The Original Special includes two hot dogs with sauerkraut, onions, or relish and a 16oz Tropical Drink. We chose kraut, the preferred New York topping I'm told. The Sabrett-sourced frankfurter itself was quite tasty, among the best I've had. I really liked the snap of the natural casings, which is heightened by the cooking method of griddling atop a flat-top grill. The kraut, meanwhile, added a nice sourness to contrast the savory flavor of the beef. This sourness was further augmented by the use of mustard, which we added later. The bun, however, would've been better grilled. As for the drink, there are a number of flavors available, including Mango, Coconut Champagne, Piña Colada, Banana Daquiri, and Strawberry Supreme, but seeing how this was the Papaya King, I had to go with the original. Even though I'm not a huge fan of papayas in general, the drink was quite delicious. Its flavor was not distinctly papaya, which was key, and the drink had a rich, smooth creaminess that hinted of dairy; it wasn't merely juice. 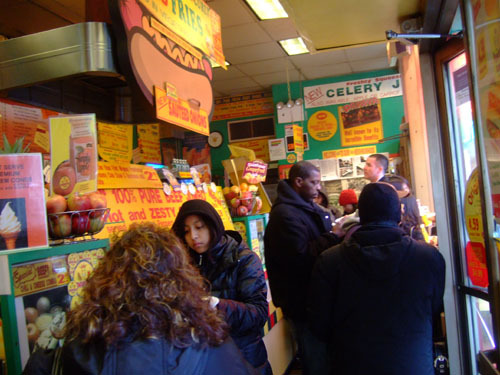 The Papaya King has become synonymous with the New York hot dog, and really is a culinary beacon of the city, appealing to people from all walks of life, from locals to tourists, the marginalized to the gentility. It's simple, straightforward, unpretentious food, but at the same time represents a true dining destination, one definitely worth a visit if you're ever in town. 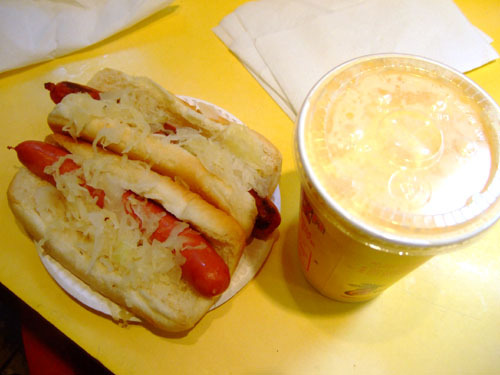 I hate to think how many Papaya King hot dogs and half mango/half papaya drinks I had in the 10 years I lived in NYC. Gray's is a just sad imitation. Geoff: I went to Gray's afterwards and also felt that it wasn't quite as good. I should've tried Papaya Dog as well for comparison. 5 Star Foodie: Inn at Little Washington is definitely on my to-eat list next time I'm in the DC area. So far my favorite is Citronelle. Gray's Papaya is great, wish they had something like that in NY. Tacos aren't a bad substitute though. Well I guess we have Pink's in LA. But yeah, Gray's was a clone of the King started by an ex-employee. I went to Gray's right after Papaya King. That'll be my next post. ever the glutton with two consecutive hotdog places. NICE. Pink's is pretty good even though chowhounders and other foodies don't like it. Who doesn't love an Ozzy Osbourne dog? And after Gray's, I stopped for a dog from a street vendor as well. Glutton indeed. As for Pink's, I still like it despite naysayers, though the lines are a bit troublesome at times. Next time you are in NY, try Crift Dogs in the East Village, and order Spicy Redneck. I ahven't had anything like it in LA. I just checked out the Spicy Redneck and it looks really good. Hot dog, bacon, chili, slaw, and peppers--sounds like a winning combination to me.